combination is possible with the right parts and our suspension and engine set up services. Focused on rock crawling, mudding, high speed forest roads or just want great comfort while casual trail riding? We can set up your quad to get the best out of it. During a set up consultation, we lift the vehicle so that the suspension is fully extended and measure from the frame to the floor, then we let it settle at vehicle sag and measure it again for static sag. We then insert the rider and passenger(s) (SxS) and measure it yet again. We will then bottom the quad onto the bump rubbers and take a third measurement. Now with a full snapshot of the suspension support travel we can evaluate and set the spring preload and spring rate to best optimize the ride. Often, we find the stock springs woefully inadequate requiring an inordinate amount of preload to hit target sags. The vehicle will be more stable and predictable if the proper springs are used to hold it at proper geometry. An over preloaded shock will have a ton of extend energy and the quad won’t want to jump or brake with much stability, and it will bottom easily without the correct springs. Getting the chassis correct will give a massive boost in confidence at speed and will maximize ground clearance, safety, and fun. For maximum enjoyment, we may recommend an Elka Shock Package to allow us to not only control the damping, but use Elka’s brilliant tunable dual spring set up to give you the best of both worlds, namely a soft compliant initial spring set up, then a firmer lower spring rate as speeds pick up and you near the bottom part of the shock travel. We will custom pick those spring rates and crossovers to best meet your exact weight and riding style. As always, we will train you on what we are doing and why and then guide you on how to make adjustments after you leave our shop. ATV and SxS sag and set up starts at $110, but 3 hours ($330) is often more realistic and is done by booking an appointment at our shop. Off Road ATV shocks generate an incredible amount of heat internally. The piston wear band is flying up and down in it’s bore generating lots of contamination, especially in a new quad during break in. We recognize that we need to change the oil in our engine every year, but we somehow think the 0.4 litres trapped in our shock since our quad was new will last forever! Most riders don’t feel the slow 1% shock oil degradation every time we ride the vehicle, but the oil slowly fails as engine heat and constant bump motion break it down thermally and dilute it with suspended contamination. Sediment drops down and accumulates around the shaft and the seal head inside the shock, making it sticky and reducing ride comfort. Most will only service the shock when it finally gives up, fails completely and dumps its oil out. You don’t wait till a connecting rod comes out of your engine cases before changing your engine oil do you? Expect a dramatic improvement in comfort, bump compliance and performance with just a shock service, which gives us the chance to remove all the break in contamination, clean the shim stack and rebuild it with fresh nitrogen, synthetic oil and grease. Base price starts at $90 for rebuildable straight body shocks and goes up to $125 for full reservoir shocks. As with any shock service, this does not include any required seals, o-rings, nitrogen seals, lathe polishing and other repairs that may be needed after inspection. Revalve service and Respringing is available if improvements are desired. A common issue with stock ATV shocks is simply they are valved far too soft for a sporting application. Another issue we often see is for tragically slow rebound. Slow rebound is ok if the vehicle is being operated at a walking pace, but as soon as the operator picks up the throttle, even a little bit the lethargic rebound doesn’t let the quad recover back up to sag height before hitting the next bump. The result is a low vehicle ride height and a confused sensation that feels like very stiff compression due to the shocks living down in the bottom of their travel as they encounter bumps. Depending on the quality of the original shock package, we may be able to service and revalve the shocks to get the best out of the OEM supplied components! The revalve fee for a pair of shocks starts at just $65 plus shims and will be added to your shock service if you need it. Shims range from $2.50 to $3.00 each. We may need two or three in a shock that is close, or 10-12 or more if the shock is way off. We can guide you completely on your revalve needs and let you know if you would benefit. Quads and side-by-sides tend to be very hard on A-arm collars and bushings. When we lift the vehicle up to get our top up measurement if we are doing a set up, or to remove the shocks if we are doing a shock service, we can grab the wheel and check for play in the caster and camber directions. 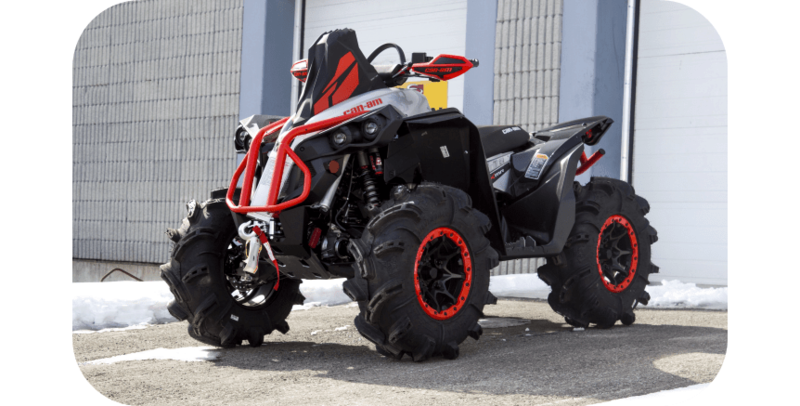 If excessive, you will be putting up with an imprecise steering quad that clunks and rattles over the bumps and will get increasing sloppy over time, rapidly wearing the tires and other consumables at an exaggerated rate. While in there, we check wheel bearings and brake pads and replace if necessary after checking with you about these items. Due to the nature of the environment these vehicles are operated in, they need lots of grease, love and lubrication! If you aren’t up for it, give us a call and book an appointment. Making sure all these critical pivots are smooth and lubricated is what makes a brand new quad feel… well, like brand new. None of these bearings are very expensive (usually $10-20 each) and with the suspension out, half of the labour has already been done. Bad bushings are often hard to feel but make the quad hunt in a straight line and ride poorly, reducing rider confidence without knowing why, reduce bump compliance for sure and if left longer, full seizing can result with dramatic effects on safety. Our labour rates are $110 an hour. A-arm bushings can take ½ an hour to 2 hours per corner if they have been ignored for years. After the suspension is set up, and maybe new shocks are installed, what is next for your performance quad or UTV? We have installed beautiful light weight wheels with custom selected tires to best match your expected type of riding to the type of response and comfort you want. Accelerated Technologies has a test track on the property where we fine tune often just air pressure in the tires. Stiffer side wall tires can operate at much lower pressures than weaker sidewall tires to protect the rim. Other times we use the test track to custom map fuel injection after several modifications. Whatever your performance heart desires, Accelerated Technologies is there to help you out! Labour rate is $110 an hour for most Performance Improvement projects. Less prone to minor damage, having a major effect on handling, ATVs and UTVs can still collect a rock or a tree at a bad time. If you have an obvious injury to your ‘baby’ or a more subtle handling gremlin after a big landing, give us a call and we can look at alignment, toe in/out, and review baseline set up. Maybe a chassis improvement can help keep your quad or UTV between the trees better than ever. Labour rates $110 an hour. Fork tube straightening is $100 per tube. Get the setup you and your vehicle deserve.